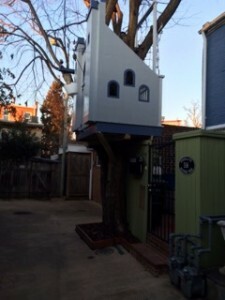 Built by some loving parents for their 3 and 5 year old daughters, the tree house, I discovered, is tucked away in an alley that’s off . . . another alley. Even Google maps couldn’t locate it. No truck or car (unless it’s a tiny zip car) can drive through it. The problem is, according to some, the treehouse slightly extends into “public space.” Even though the parents applied for and got every government authorization they were told is required, some “outraged” citizens claim they didn’t get enough approvals from local agencies. Give me a break. As you can see from the photo this is a lovely tree house. This saga reminds me of some mediations I’ve handled. One party refuses to settle; there’s still one more item to be addressed. Yes, agreements need to be airtight with as little chance of slippage as possible, and in our mediated agreements, we try to cross every T and dot every I. But some parties never seem to be satisfied. Some can’t take YES for an answer. I have found this approach more effective than chasing our collective tails looking for a reasonable outcome that all can agree on. I wish it were that simple with the tree house issue. The parties remain deadlocked. And the next step is a public hearing on January 28. Stay tuned. Attorney Jim Loots is right! As a mediator I should have realized there is always another side to an issue. Sometimes, as in this instance, several sides. I appreciate his comments which reinforced my understanding of the need to examine EVERY perspective on an issue before commenting on it. Lesson learned! some people have too much time on their hands and no discrimination.